On Friday, I asked you all to spend this week tabulating, at least loosely, what $2.50 will buy you in terms of “real food.” Some of you have already responded; some will probably respond later in the week; and I’m jumping in today to get the ball rolling a bit with a look at the RRG family table. It was by no means an extravagantly expensive meal, but if I look at it from the perspective of $2.50, it’s actually pretty encouraging to see how much of the food that’s pictured here could end up on the menu. A third of the chicken that’s on that platter would be available to you for $2.50 — enough for two good portions. You’d be able to have the whole bowl of spinach, and since I made it from fresh organic baby spinach leaves, I should also point out that $2.50 would buy DOUBLE that volume of frozen chopped spinach at most grocery stores. As to the stuffing, I made the cornbread myself at a cost of about $1 for the pan; adding in the cost of one apple and the few other miscellaneous ingredients that made up this dish, it’s actually possible that you could have almost the entire bowl of cornbread stuffing for $2.50. When I do the math on this meal, accounting for all the ingredients that were used — yes, including the olive oil, garlic, herbs, etc. — I figure it comes out to about $14-$15 for all the food you see here. And in the spirit of full disclosure, I’ll point out that almost everything we used in this meal was organic. Hm. At about 8 servings of the stuffing, at least 6 of the chicken, and (sadly, only) 4 of the spinach, I can’t help thinking that this was a pretty good “real food” value. What would $14 have gotten me at a fast-food place (since that’s the impetus for the $2.50 challenge — the startling statistic showing that Nevadans spend an average of $2.50 per capita every day on fast food)? Hard to say, since I’m not intimately familiar with fast food menus, and the online information for the value menus I did look at generally says “pricing may vary.” However, let’s assume that we’re working off a dollar menu; I know you can get, for example, a double burger with cheese at Burger King for $1. I’m also aware that most fast food joints offer a chicken nugget-esque option (even, possibly, crown-shaped! O joy of joys!) for $1. And there have gotta be fries available for $1, probably in a monstrous portion. So…at $14, you’d be able to feed seven people their choice of a double burger or chicken nuggets with fries. No drinks, but hey, I didn’t include drinks either (though, since we often drink water with dinner, ours would be free). Seven people eating double burgers and fries….vs. 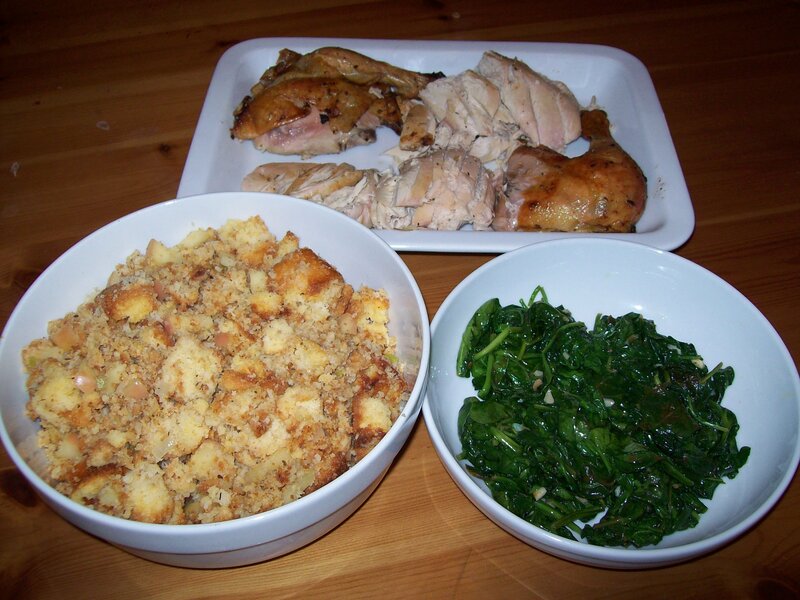 six people eating roast chicken with cornbread stuffing and spinach — I’m rounding things out a bit here, figuring that the money spent on the extra couple of portions of stuffing could have gone to buy more spinach, but I don’t think I’m stretching too greatly. That’s the $14 comparison. But this match-up proves, at least superficially, that it can be done — real food can be purchased and prepared and served to a family for roughly the same amount of money as fast food. And one thing we need to think about, in equating prices of real food vs. fast food, is the economy of scale. That burger will always cost $1 at the drive-thru, but at the grocery store, I have the option of watching for sales and buying in larger volumes, which means that the price of my burger is actually (somewhat) negotiable. I know it won’t always come out this way. I confess that I was expecting to write a very different post today; I didn’t think I’d get so lucky as to discover that my real food Sunday dinner could stand up economically to the fast-food value menu. But on the other hand, as much as this may have been a fluke (and believe me…I’ll keep testing, because now I’m REALLY curious), I think we real-food advocates have to take the victories where we can get them. What can you get for $2.50, these days? The answer for this morning, at least, is more than I thought. This entry was posted in Accountability, Cooking, Feeding kids, Food culture, Meal planning and tagged baking, cooking, family, feeding kids, food, Food Revolution Fridays, Household organization, kids' health, meal planning, Michael Pollan, parenting, Sunday dinner, veggies. Bookmark the permalink. Your dinner looks FAB! i can’t imagine that anyone was left wanting after that meal. Try to take a family of 4 for under 20 bucks….. good luck Charlie. My jump up and down discovery of the day is my local Asian market. I decided to take a whirl at homemade Pad Thai for lunch today but needed bean sprouts. I popped in there and not only got a huge bag of bean sprouts, but also a big bag of 5 baby bok choy for 2.87. Mind you, the bok choy is not organic, but at my local big grocery store they are not organic but go for 4.99lb! I do plan to check this place out again, the owner said she gets her produce on Fridays. Real food can be done! It’s just not going to come from a drive through. *blush* Thanks! Yeah, Sunday chicken dinners do tend to be real winners in our house, and it is pretty rare that anybody leaves the table unsatisfied. Hooray for you on that great market find! I think that’s definitely something I will want to explore more — I KNOW that ethnic markets are usually great gems for certain items, but I don’t usually shop at them and really dig deep to explore exactly what you can get for a bargain there and what you can’t. And as a side note, not everything in life can be organic; this is one of those balance issues. We are certainly not fully organic in our household, but we’ve been trying hard to do better lately, and it just so happened that this weekend the organic thing really worked out. You’re absolutely right, though. Real food can be done…real food will not come from a drive thru…and that 2.87 for baby bok choy will go so much farther towards a long healthy life for your family than 2.87 in processed or mass-produced foodlike products.